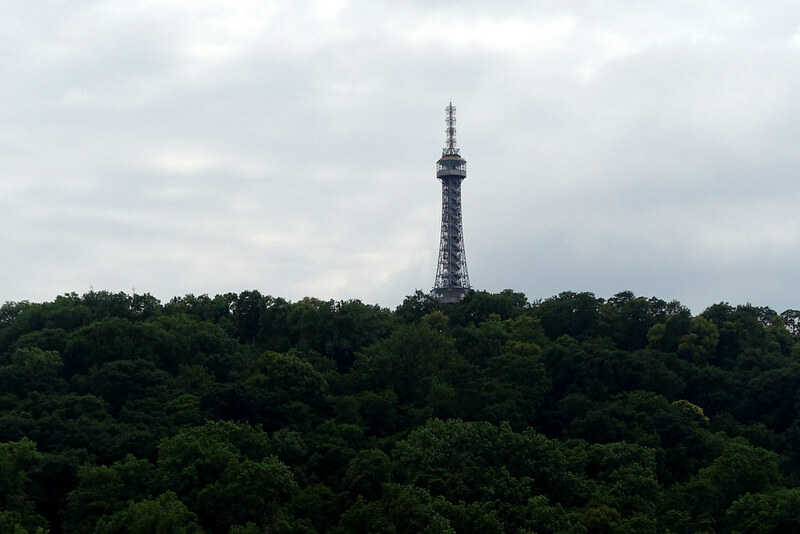 On a cloudy morning in Prague, we headed out to climb Petrin Hill. Well no, we took the funicular, but we headed out to explore Petrin Hill and all the strange and beautiful attractions to be found on the top. To reach the top of Petrin Hill you can indeed walk. 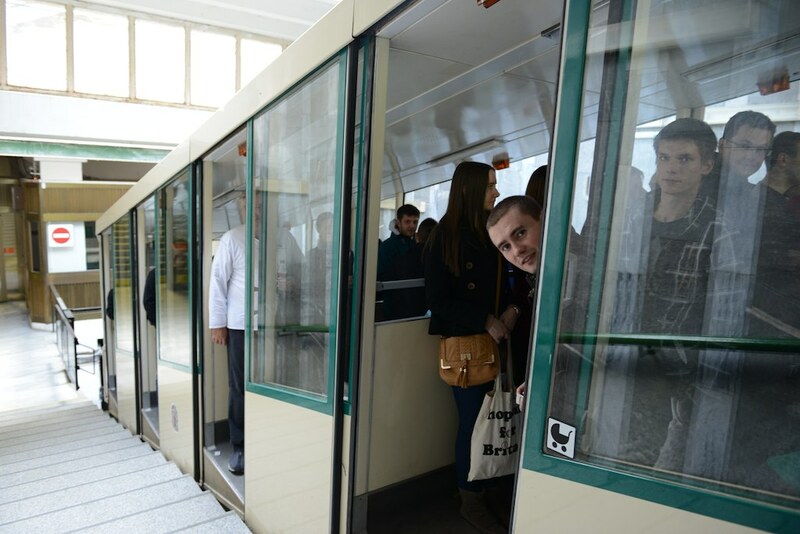 The Funicular railways are free if you have a public transport ticket so once you get off the tram, keep your transfer with you and you'll be able to get onto the funicular for free! If you walked or took a cab, you could still buy tickets inside but be sure to go inside, buy your ticket, and then come out to wait in the long line. Many people only wait in the long line expecting to buy tickets at the front of the queue and are unfortunately told to go back, purchase the ticket and wait once more. The wait is usually around 20 minutes to get to the front of the queue and load yourself, and a few strangers, into a small tram car that slowly makes it way up Petrin Hill. The view out the windows is best from the back of the tram so if you want to take some pictures be sure to stand near the back, not the front. After you get off the tram, you get to walk through Petřín Rose Garden as you make your way over to the Tower. The Rose Garden covers over six hectares, and it is said there are over twelve thousand roses in bloom in the summer months! Dotted along the garden are dozens of benches should you want to rest your feet and enjoy the sweet smells of the flowers. 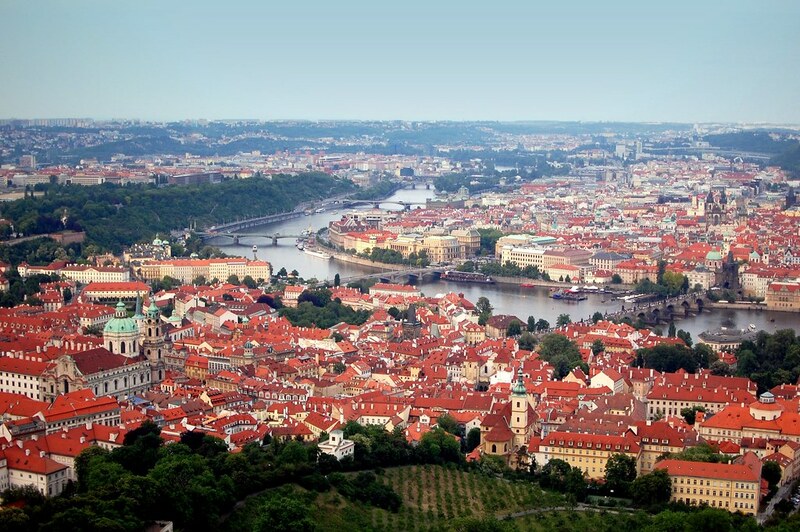 Petrin Hill rises over 130m above the Vltava River, making it the perfect place for the stunning view of the city. In ancient times, the hill was covered in rocks, which were later used to build the city. In the absence of these stones, the people of Prague built atop the hill. 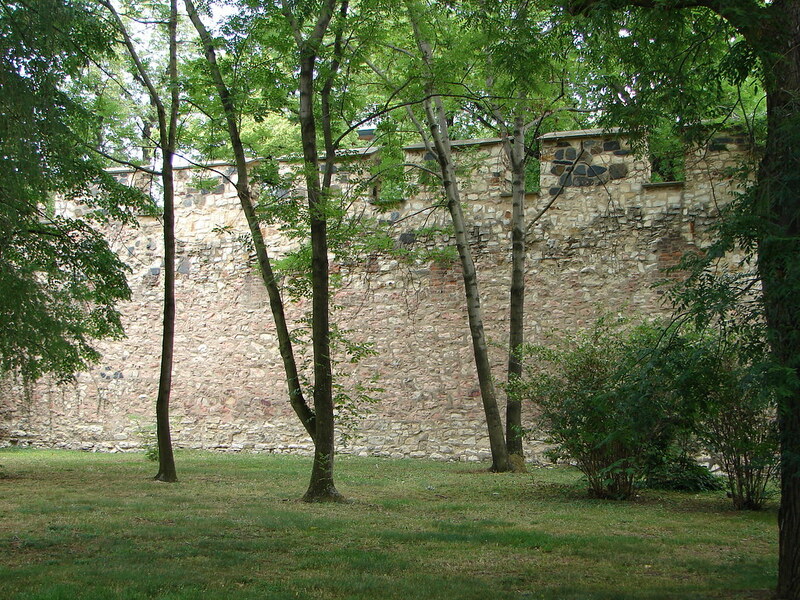 In 1360 the Hunger Wall was put up as a medieval defensive wall to protect the town from invaders. In 1891, for the Jubilee Exhibition, the Petrin Tower was built, like a miniature version of the Eiffel Tower for the people of Prague. The tower is only 60m tall, but after you climb the 299 steps it takes to reach the top, you have a fantastic view of the city of Prague below. The line up for the tower can be very long so if your hell bent on going up; it's a good idea to get tickets in advance. Since the line was long and we were a little too tired to wait, we opted not to go up and instead tooled around the beautiful landscape around the tower instead. No matter what time of the year, the gardens are always a stunning and a great hideaway to get away from the busy, busy atmosphere of the city. Beside the Petrin Tower is a small palace like building, called the Hall of Mirrors. Seeing as I was just getting over my vertigo, I decided not to venture in but Dan took the time to check it out. Inside the Mirror Maze, you'll find just that. A maze full fo mirrors. You'll bump into a few walls, but it's an antiquated attraction worth poking your head inside. In the Victorian era, people were obsessed with these types of game rooms. This was their snap chat, it was the thing everyone did, and you were nobody is you hadn't checked it out. In addition to the maze, you'll also find the "Hall of laughter" where you can stand and take your photo in front of a mirror which warps the look of your body into all sorts of funny shapes. Kids get a kid out of this one. Oddly enough, the Maze finished with a lifesize depiction of the Thirty Years War, set on the Charles Bridge in 1648. I can't tell you why this element was added, but I suppose it leaves the viewer with a piece of history to go alongside all the frivolity. As you walk through the gardens to view all these sites, you'll notice a large wall that runs perpendicular to the park. This is the Hunger Wall previously mentioned. It was built on Petřín Hill between 1360 and 1362 by order of Charles IV. It was built to strengthen the fortifications of the Castle and at one point was as much as 4.5 meters tall and armed with eight bastions. Opposite the Mirror Maze is the amber painted, St Lawrence Cathedral. The baroque facade and bright colouring make it stand out against the greens and browns of the rest of the park. Beside St. Lawrence Cathedral is St Michael Church. A wooden church from the second half of the 17th century. Although I could not go inside, I sat on the cold stone steps and marvelled at this simple church. There wasn't anything elegant about it or regal, but there was something immensely charming about its quaint appearance. Since it was a chilly morning, we couldn't resist getting a warm treat to heat up our hands. We had seen this circular treated being cooked up all over the city and couldn't resist trying one for ourselves. Little did we know that this one taste would get us hooked for the rest of the trip. These pastries are called 'Trdelník'. A Trdelník is a sweet pastry made from rolled dough that is wrapped around a stick, then grilled and topped with sugar or nuts. There is a small coating of sugar and eggs that is applied when it is grilled which results in caramelization of the sugar. They are insanely delicious, although not a traditional Czech treat as many believe it is. The trdelník was first created in the Slovak town of Skalica. The name trdelník comes from "trdlo" (a wooden tool used for pounding materials in a hollowed-out log). We were heading down from Petrin Hill towards Strahov Monastery. Walking over towards the Castle District we decided to walk down through the Seminary Garden. The Carmelite monastery gardens once belonged to the archbishop of the seminary in the 18th century, hence its name. There are over 2000 fruit trees and 800 almond trees which spread out across the gardens. As we walked through the park and out to the gardens we would repeatedly get lost and then found again, over and over as the streets twisted and turned. The weather was crisp and it was a weekday so there was barely anyone out for a walk. We seemed to be the only ones from time to time. It was so romantic, walking hand in hand through these beautiful fruit trees. When we finally got out to the clearing, we could see far across the gardens and out across the city. It was breathtaking, it seemed so clear like we could see forever. Far in the distance, we could see the dark towers of Prague Cathedral surrounded by the pastel coloured houses of Mala Strana. 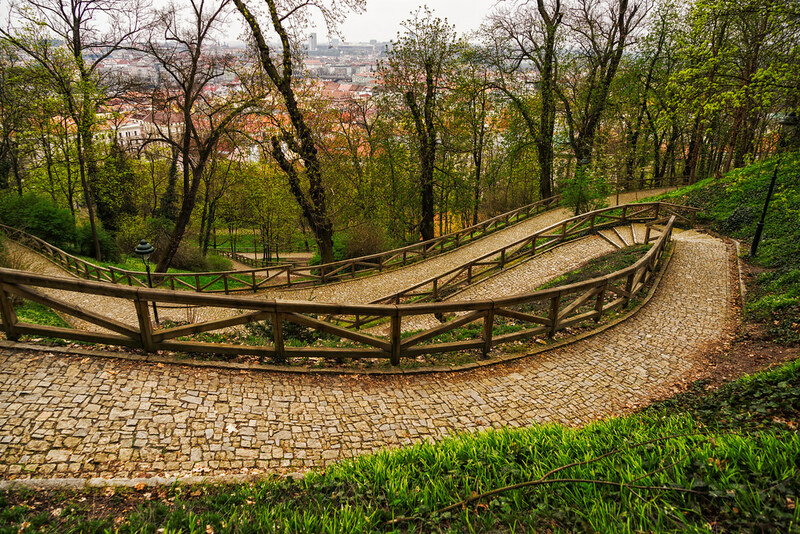 Petri Hill is definitely one of the less busy parts of Prague, so if you're in town during a high tourist season, an escape out to Petrin Hill will be a welcome respite from all the crowds.